Every time I take a bite, I can’t help but remember two of the biggest ecological challenges we face. Both are caused directly by agricultural practices. Both are driven by the U.S. appetite for cheap food, and lots of it. Here they are: 1. Factory farming degrades the oceans. 2. Livestock takes the place of carbon-sequestering forests. These problems are huge. Their global scope sweeps up all the billions of people on the planet, and an international political solution is in its infancy. At first glance there doesn’t seem to be much an individual can do. But there is. All the ecological issues we face today are the result of market forces, and markets are made of individuals who create supply and demand—one person at a time. And if enough people act in concert, then it’s a trend. Maybe a movement. That’s the start of some real power. Read on to learn about the issues, their causes, and suggestions for what you can do about it starting today. Part 1, Unhealthy Oceans In the U.S., our food is already the world’s most affordable (do you like statistics?). One reason is factory farming, which became prevalent after World War II. A modern commercial vegetable or grain farm has hectares of monoculture—the same crop in efficiently machine-cultivated, chemically-fertilized fields as far as the eye can see. Commercial livestock operations pack animals into a small space and feed them more economically than a traditional farmer can. Factory farming supplies foods that are cheaper than the hand-farmed produce of a century ago. But there’s a tradeoff. These boundless vistas of corn, wheat, soy, chickens and cattle ooze pesticides, herbicides, bacteria and nitrates into watersheds that drain into the ocean. The result is stunning. 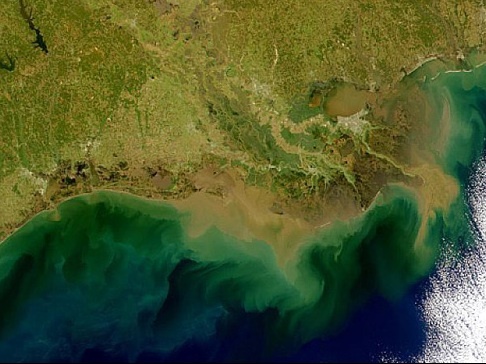 Along the coast of Louisiana, a plume of dirty water stretches from the mouth of the Mississippi River to the Texas coastline. This Gulf of Mexico Dead Zone is one of many such places worldwide. Seasonal clouds of farm runoff provide fertilizer for blooms of algae, which deoxygenate large swaths of ocean. Animals unable to swim away simply die. Fisheries crash. Boats spend more time and fuel traveling farther out to sea to catch a dwindling stock of fish and shrimp. Within our grandparents’ lifetime, a massive change in agricultural practice has become a threat that could kill the oceans, perhaps beyond recovery. How quickly we could have an impact if we restored a less concentrated agricultural model, where the business of food growing returns to the patchwork of farms that was our country before 1940. Here are two recommendations: We can work to reverse the trend of monoculture, support mixed-use farming, and help lessen the demand for cheap meat. Buying from smaller, local farms can fuel a movement. We can review public policies that shape life for farmers. Which policies reward diversification? Which punish conservation? Which give an edge to agribusiness, and what changes could level the playing field for small farms? Or, think of it this way: Large agricultural conglomerates are letting their senators and representatives know which policies they want. Shouldn’t small farmers do the same? Couldn’t they reach out to their customers for support? If your favorite farmers’ market vendor asked you to e-mail your legislators, would you do it? Amy Boland is a Twin Cities writer and food enthusiast. Her last article for Simple, Good and Tasty was How Our Food Choices Affect the Weather. You can read more of her food musings on her blog Cook 'Em if You Got 'Em. This post was proudly submitted to Food Renegade's Fight Back Fridays.